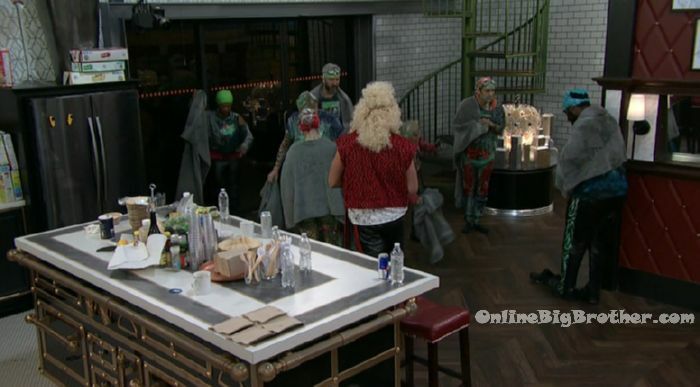 10:10pm The feeds return with the house guests coming into the house. They congratulate each other. Tom – who wants to go work out?! I am kind of concerned that I couldn’t go that long and that everyone else went a lot longer. The house guests start clean themselves up. 10:37pm Ryan comes in to the bedroom to congratulate Kato on winning HOH. Ryan – I know I am probably a big target. Kato – I want to get your feel on how you feel about things. Ryan – I am just going to say my thing because I am mostly likely probably going to go on the block. I just have a feeling. Kato – I haven’t even figure out who I would put on the block. Ryan – if you don’t I would be a good ally for you because I am going to try and go and win every competition. Kato – yeah .. and you will. Ryan – but what do you mean my feel? kato – you said earlier that you wanted to see your family.. Ryan – oh I want to see them but I want to stay. I want to stay as long as I can. Kato – we’ll figure something out because I want you around. 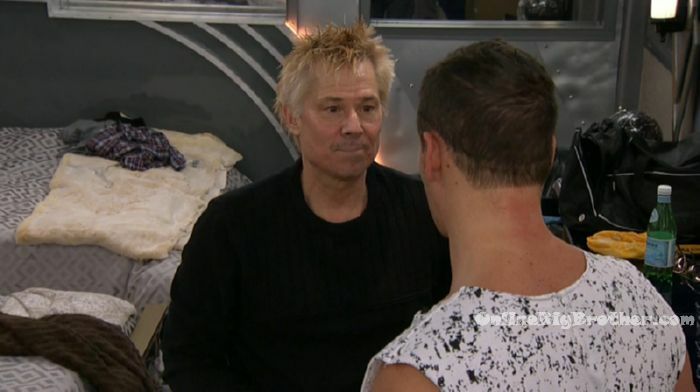 Ryan – in the beginning we had an alliance with the girls.. me and Jonathan. .. and that got screwed up. They have their own alliance with whoever I don’t know I guess the whole house. Kato – we’ll figure out a plan. Ryan – you keep me around and I will be a good ally for you and I will work with you. Kato – I will talk to whoever .. but I want to keep you on. Ryan – we’ll talk. Ryan leaves the room. 11:30pm The house guests are still showering / eating. Lolo asks Dina why here hair isn’t green. Dina says she doesn’t know. Lolo- I’m about to lose my motherf**king mind! Tamar – No you’re not! No you’re not! Lolo – she (Dina) has no green hair. Why does my sh*t look like a f**king ninja turtle!? Tamar – you might have had an organic chemical in yours. You never know what other chemical mixed. Lolo – Just tell us! Just tell me?! They warned her about her high heels. And don’t have me in the diary room with cold hair.. like you know how cold it is in there. That’s when I lost it. Having me chilling in the cold diary room when I’ve been sick. 11:50pm Kitchen. Natalie tells Ricky / Ryan how she is 6 years sober. Ryan talks about how when he would drink it would be bad because he would mix it with an ambien. He talks about getting help. 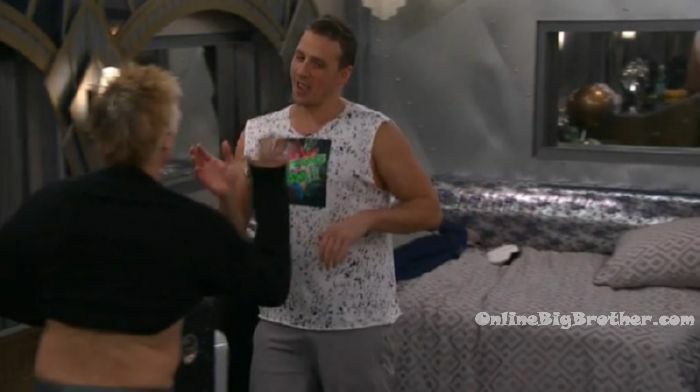 Natalie congratulates him on getting help. 11:50pm 12am Bedroom. Lolo and Tamar. Lolo – they’re on a roll now .. their confidence is going to be real high. Tamar – it was just a bad idea. I saw it. Lolo – no they’re cool, I like em. Tamar – roll with it. You roll with it when you’re in an alliance. Lolo – I like them. They’re underdogs and I like underdogs. They’re not putting you up this week. You’re good. Tamar – I don’t see why they see me as such a threat. Lolo – I don’t want to talk game .. my hair is green. 1am Dina and Kandi playing cards. Kandi – so Dina .. why didn’t you vote for me? Dina – Ugh… it was a sh*t fest. (lol) They said oh Kandi’s not going to go up but if you vote there then it will be even and then Ryan can take Jonathan off the block. They lied! The girls lied! Because they were voting for him.. and one for you know who by the way. And I knew there would be too many numbers. So I said Kato who are you voting for .. and they didn’t let me in on anything because I guess they figured I was friends with Jonathan. They all lied to me. Everyone of them. They told me you were safe. I knew your numbers weren’t going to be anything. I didn’t know he would be zero .. because they lied ..the girls. They’re all f**king liars. Dina starts to cry. Dina – and Kato doesn’t tell me sh*t. Kandi – don’t cry. Dina – all those girls… I don’t like f**King people like that. ‘I’m just not used to people doing things like that. Ask Joey .. get him up here. 1:23am – 1:40am Kato gets his HOH room. They all rush into his HOH room. Natalie – you have a girl friend? Kato – yeah. Natlaie – She’s hot! 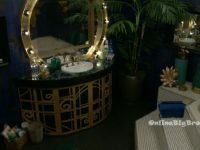 They check out his HOH basket. 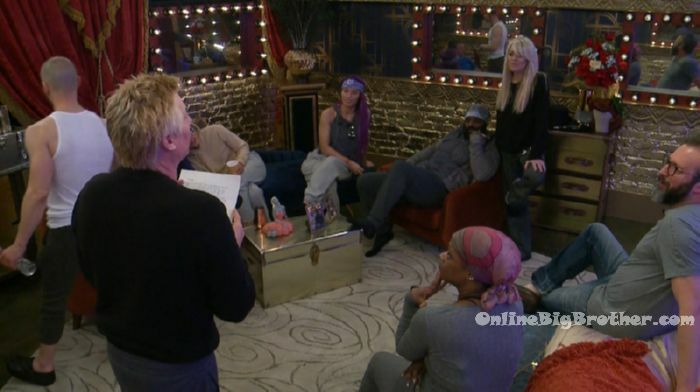 Kato reads his HOH letter from his girlfriend. 2am Ryan and Joey. Joey – Tom played the part perfectly. Like he couldn’t have played it more perfectly… like the way he fell off .. the non-threat. He will be one of the last ones because he is such a non-threat to do anything. Ryan – yeah. And I love him but they don’t view him as a threat. Ryan – we have to think smart now. But I am gunning for them. I will say it to their face. Joey – dude we have to break them up somehow. Ryan – and the way you break them up is if you put Natalie and lolo on the block. Joey – that would be genius. Ryan – it would be the best move ever. Joey – they would turn on each other in 5 seconds. Done! Ryan – it would be over.. it would be done. Joey – is there a way we could sugar that into Kato without him thinking.. like this is a growing monster here.. Ryan – I planted the seed. I said he needs me because I am going to try and win all of the competitions. Look he had an alliance with them and those three girls ..we had an alliance with them and they turned on one of them. I said those three girls have an alliance. That’s a pack that you have to watch out for. Hopefully its in his head. 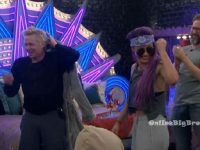 Joey – They made everyone think that Kandi was the sacrificial lamb .. and people believed it. Ryan – he is not going to put up Natalie because he promised her. And hopefully not us two. He likes Dina. Ryan – I would obviously put up Lolo and Natalie. I should have done that. Joey – yeah .. could’a, should’a, would have. Joey – it has to be a principle thing where they have to go first. It is going to go f**king fast now dude! 3:55am All the house guests are sleeping..
Wow! These celebrities are here to play (minus Kandi). Gotta respect that! I honestly thought Tom was going to hyperventilate at one point. I thought Kandi would stick it out longer given she just came off the block. Tamar is just ridiculous. Tom’s facial expressions during Tamar’s meltdown were very telling. Not sure, but I think he calls BS on Tamar. Dina did great. I share a birthday with her, and honored to do so given her impressive performance on that wall. I’ve always loved her name (given name). Kato winning was a surprise….way to go Kato. I predicted Lolo would win. I’m not sure how I feel about this open-door HOH policy that Ryan, Kato, Tom, and Joey have promised the HGs. I love that Ricky plans to honor the HOH room tradition for himself if he wins it. HoHo and Whoa can take their a$$ home!!! Tired of the whining. Is it possible that Joey can just go home next eviction? What a waste of a casting spot that guy is. Tamar is basically walking herself right out the door one way or another (on the block; self-evict; Lolo sends to hospital; BB tosses her out). 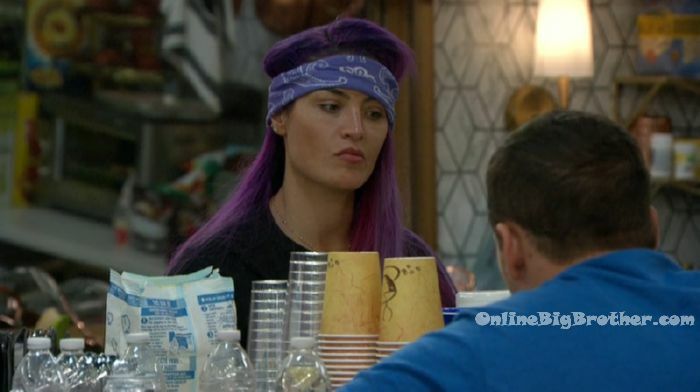 At this rate, if she doesn’t leave, there will be no live feeds. Ugh! Can Tamar talk without moving her head? I didn’t know a head could make some of those moves. I don’t have the feeds, can you fill in what happened? Tamar is on my last nerve and I only get to read what’s going on. It all really started with Kandi. Tamar was talking smack about Kandi day 1. She tried to start up some drama, but Kandi took the higher path and just tries to avoid her. Eva and Lolo were turned off by Tamar’s behavior and have been on high alert ever since. Tamar is passive aggressive and then tries to play off any perceived aggression or negativity as “playin'”. I know her type, and she is definitely one I, personally, would avoid. Lolo has lost her patience with Tamar. 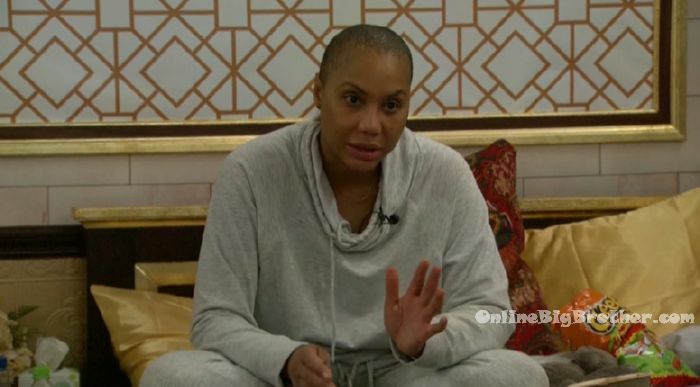 Every time Tamar asks Lolo for her opinion or for the “what happened” Tamar turns on the negativity or turns the story around. She has done it time and time again. Lolo is sick of it, and I can’t blame her at all. My take on this is that Lolo could get herself in trouble if she’s not careful. Tamar knows how to push her buttons. Lolo needs to learn to blow it off like Kandi does. Lolo doesn’t trust Tamar….I mean who would after that throat comment and all the shade she throws around? It’s crazy how Tamar just wigs out all the time and then brings back her composure when it’s time for game play, claiming she’s “good”, “we’re good”, “everyone’s cool.” She’s got to go. That sort of toxicity is dangerous. I’d be surprised if she sticks around another week. *disclaimer: I do not know Tamar at all, so I only have the live feeds in which to base my opinions. I know she is away from her kid, and that can be very difficult…not to mention that she suffers from acrophobia, aerophobia, astraphobia, claustrophobia, ophidiophobia, autophobia, etc……. I’ve watched Braxton Family Values since the first season and you are seeing the real Tamar & not even at her worst. She’s the youngest of five sisters and she has been spoiled and she holds everyone emotional hostage. The head bobbing and histrionics are her normal behaviour. Poor girl. She doesn’t need CBB, she needs professional help. Lolo told her that she needed to calm the f**ck down. That Tamar was always going off on someone. Popping off. Feeds down for more than 3 hours. ( Nominations I guess. I may be incorrect in some things said..but that’s the gist as I understand it. Tamar is agressively so..and a very unpleasant person. I sense some serious issues going on there. Lolo is also quite an angry person, so I expect some drastic drama going down. Jon gone. I went off him a bit..when he told Dina that Ryan was going to nominate her. That’s not loyal. Kato and Tom really, really are in this to win. Kato, at 59 years old..doesn’t have much going for him job wise. He seems like a very nice person..and I give him props for *hanging* in there for the HOH. Natalie is my fave amongst the ladies. Her openess about her getting sober is praiseworthy. How she puts up with Tamar..well. Joey. Geeze. What a whinger. I just can’t. Granny is a OBB Gem. Like a slice of pie she’s so delicious. She’d like to manipulate your mind! It was only a matter of time before someone went off on Tamar. That woman could make a monk lose his zen. So this is the new quote for you, Simon. LOL! Not hating. Not at all. But….what a complainer. It’s constant..from a lack of LETTUCE to being cold on the wall. A not very robust Kato just DID it. Dina hung in there. Quietly. The only other moaning was from Ms Histrionics. aka as Tamar.